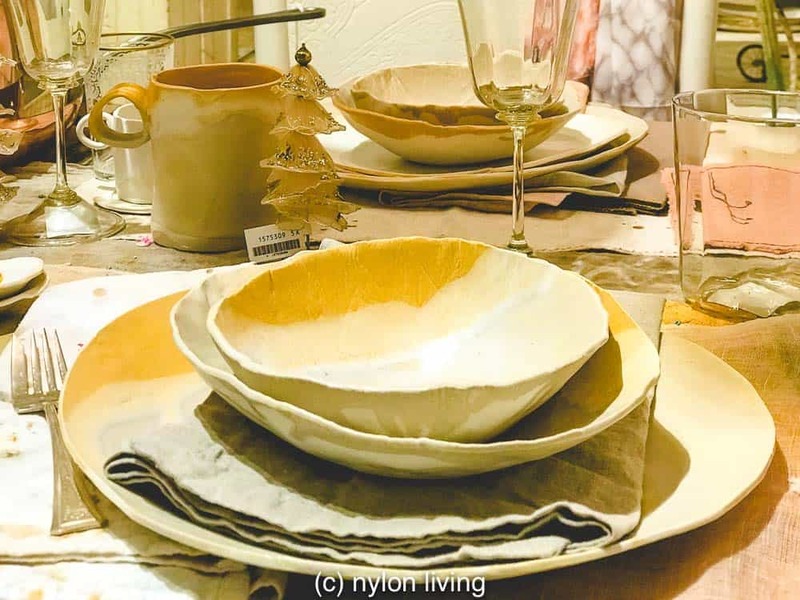 I love boho chic table settings in the dining room because they are so versatile. Vintage, mismatched and earthy, a contemporary casual elegant dining vibe is easy to put together. 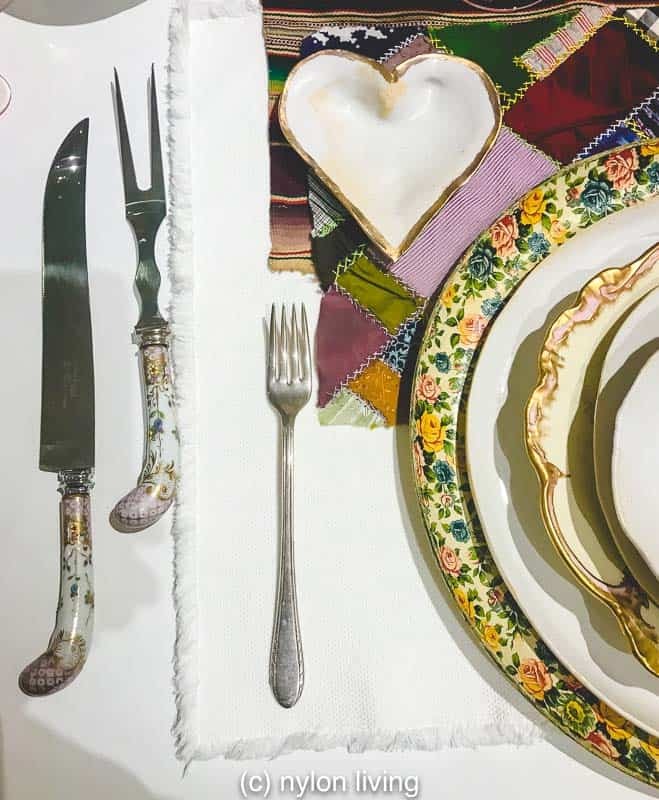 A boho dining attitude emphasises good food and company instead of expensive heirloom pieces and matching-everything. Having said that, I wish I had inherited Christofle silverware. So you want to invite 12 people around for dinner? Who has a matched set of 12 dinner plates, salad plates, dessert plates etc. anymore? And, put those paper plates away. They look terrible AND you are ruining the environment. How can you enjoy your heirloom tomato salad on paper plates? Totally impossible. It’s so much more fun to find beautiful pieces that speak to you in a vintage store or flea market. Mix and match and voila! Create your own boho dining experience. Of course, the doyenne of New York boho decor are the fabulous people at ABC Home and Carpet. Anthropologie just took the ABC Home look of boho luxe and made it mass market. 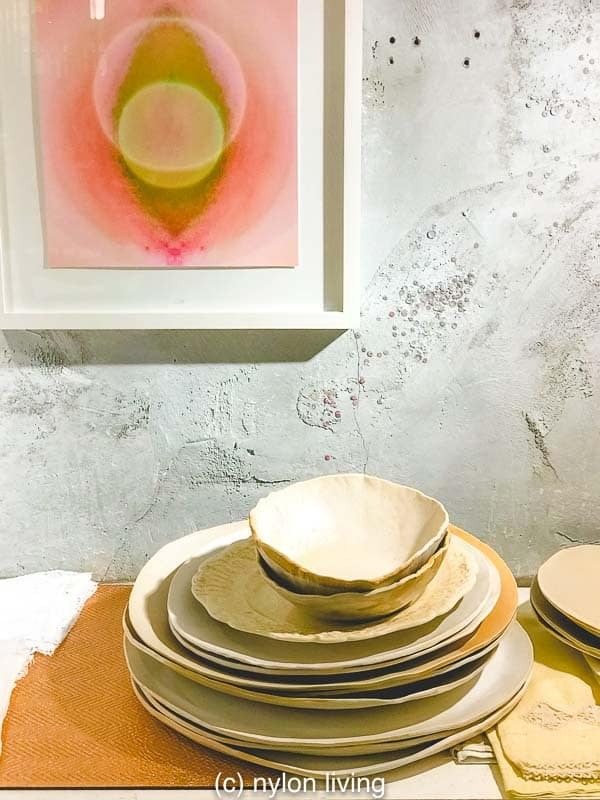 Check out these boho chic table settings I saw at a recent wander around ABC home to elevate your casual elegant dining to the next level. I love the look of clean white plates. They allow you to accessorise the table as you want and provide a perfect background for a well presented meal. The handcrafted look of artisanal plates. With a neutral color scheme, remember to add texture and shape to elevate the look from boring and humdrum. Who said boho table setting for one was for the sad and lonely? The usual look of mix and match tableware tends to be colorful. Let’s face it, vintage tableware for the most part was colorful and patterned. 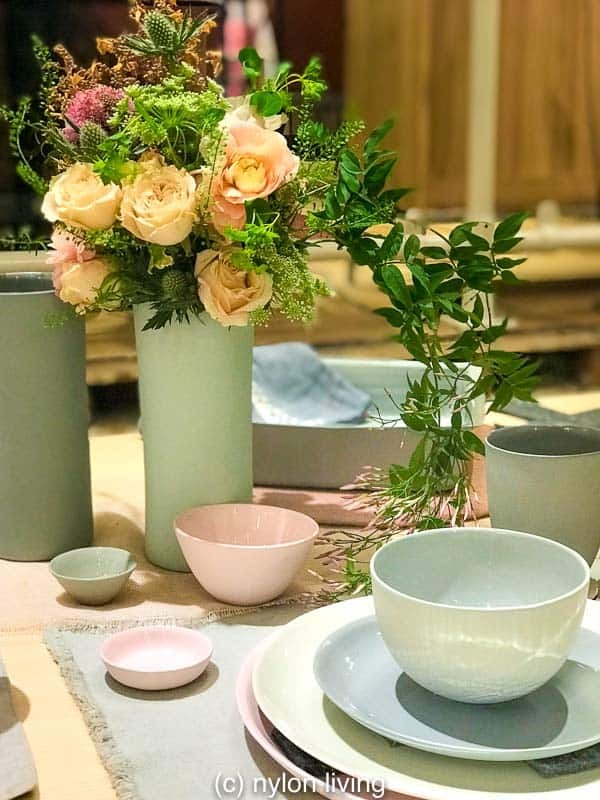 If you can’t do florals and prints, check out contemporary porcelain homeware such as this setting from MUD Australia in candy pastel colors. Pastels are a chic new way to decorate the dining room. 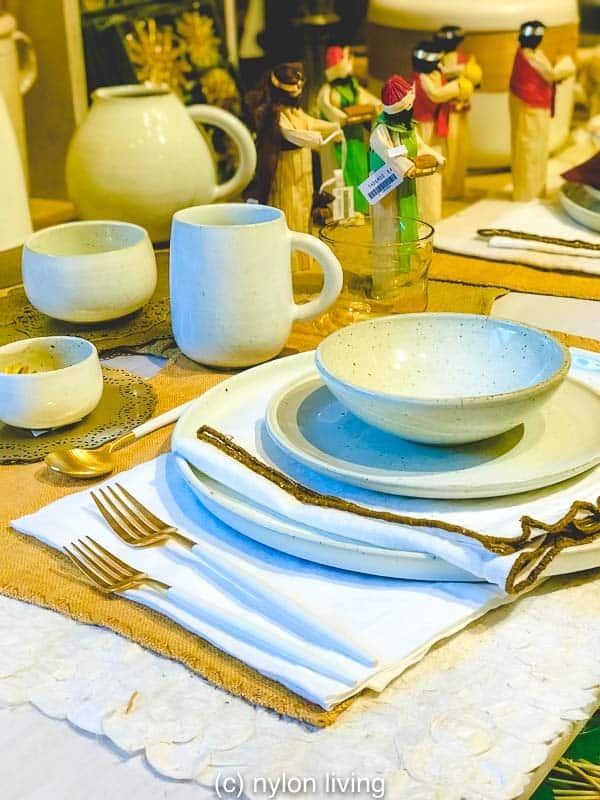 If you’ve had enough of the usual garish Christmas decor but you are not quite ready to say bah humbug, consider these tasteful options for holiday casual elegant dining. 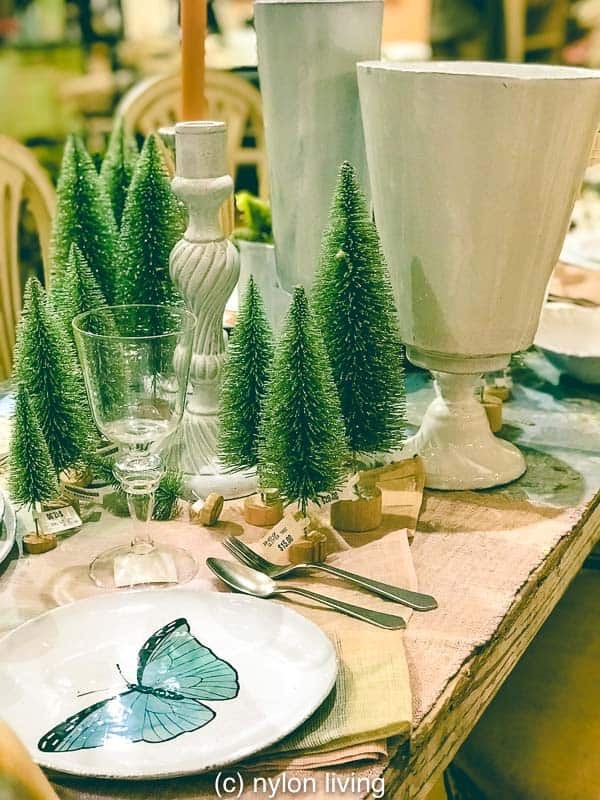 If you don’t have the time to assemble a whole vintage set from scratch, then you should start with a small table setting and add to it. 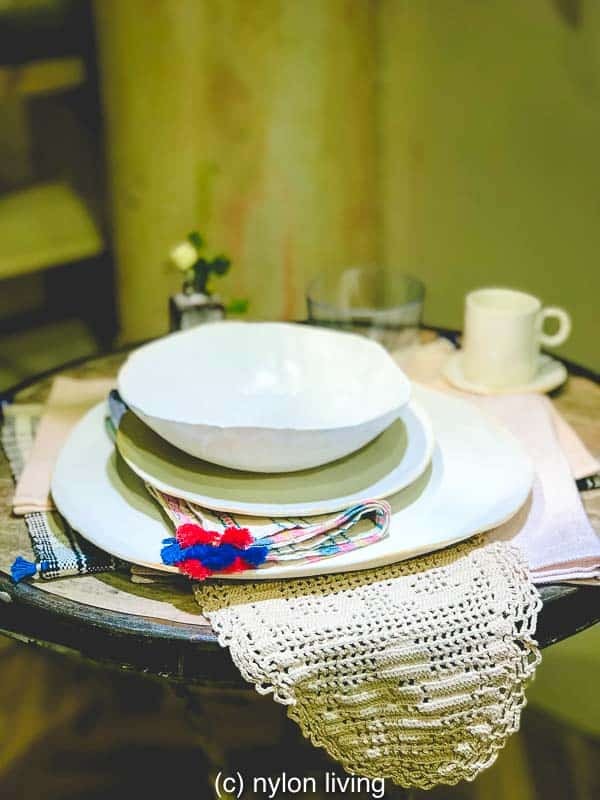 Spread across several place settings these pieces will blend right into your casual elegant dining atmosphere. Also, on the plus side you won’t have a whole set of Christmas dining pieces that you will only use once a year. Instead of the usual floral centrepiece, sprinkle a few small Christmas tree ornaments on the table. 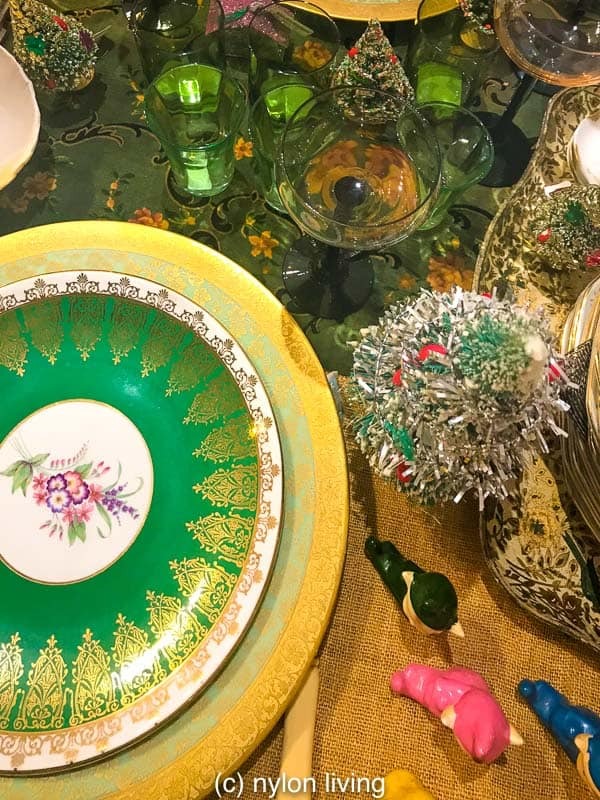 Bring out the vintage plates for a holiday dining table. Traditional dining tables with their carefully set places, matched plates and silverware are just too staid for the way we live now. Have fun, be creative, be you. Spode Christmas Tree dinnerware set; Lennox holiday plates; pfaltzgraff winterberry dining; Lenox butterfly dessert plates; Bitossi assorted glass tumbler set; Ironstone plate; wrapped stoneware taper holder; Santa water carafe.